Fine Wooden Embossed Office Set. 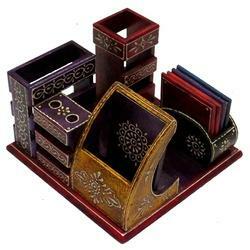 Wooden Embossed Office Set available in Different Designs & Sizes. We are manufacturers and wholesalers of Modular Workstations, Chairs and furnitures catering to all kinds of Office requirement. 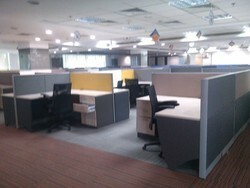 We are offering all types of office furniture. This furniture is manufactured using the best quality raw material and modern techniques. Being a prominent firm in this domain, we are engaged in offering a distinguished assortment of Director Room Furniture. The last thing you want in a small home office is to be swamped by reference material. Documents you “might need one day can quickly take over limited storage space at the expense of your real work. For the purpose of providing the finest Modular Corporate Furniture to our clients, we engage in using the finest raw materials and modern machines in the manufacturing process. Owing to this, the offered range provides superior durability and commendable sturdiness. Owing to our skilled professionals, the product has a fine finish and a highly luxurious design. Being a leading manufacturer of executive office furniture, these modular furniture helps in organizing the workstations and increasing productivity. These are manufactured using the finest solid hardwood, hardware and accessories. These can be customized to meet the specific requirements of the customers. We are looking queries for Delhi/NCR region. Dining furniture designs are plain in appearance, stripped to bare essentials (few turnings, no decorations), featuring natural materials; no ornamentation; strong emphasis on function.Dining furniture designs are plain in appearance, stripped to bare essentials (few turnings, no decorations), featuring natural materials; no ornamentation; strong emphasis on function.